Every year, Holland Endodontist Brian J. Buurma DDS and other endodontists throughout the country perform over 15 million root canal procedures, helping patients save their natural teeth and prevent the need for bridges or dental implants. Root canal treatment becomes necessary when the pulp inside your tooth, which contains a collection of blood vessels that helps build the surrounding tooth, becomes infected. Usually caused by trauma to the tooth from decay, cracks, chips or repeated dental treatment, infected pulp may cause visible changes to the area surrounding a tooth, swelling of the tooth, pain in the tooth and gums or increased sensitivity to temperature. If you experience any of these symptoms, your dentist will most likely recommend non-surgical treatment to eliminate the diseased pulp. This injured pulp is removed and the root canal system is thoroughly cleaned and sealed. This therapy usually involves local anesthesia and may be completed in one or more visits depending on the treatment required. Most patients are still able to drive themselves home after treatment, and can quickly return to their normal routines. After treatment, a record of your treatment will be sent to your dentist and you should schedule a follow-up within a few weeks of your procedure. Your restorative dentist will decide on what type of restoration is necessary to protect your tooth. It is rare for root canal therapy patients to experience complications after their procedure. If a problem does occur, however, we are always available to help. The costs associated with root canal therapy vary depending on the severity of damage to the affected tooth and which tooth is affected. However, in most cases, endodontic treatment is much less expensive than tooth removal or replacement with an artificial tooth. If you would like to know more about root canal therapy, Dr. Buurma and his staff can help you understand your options and choose the best solution. 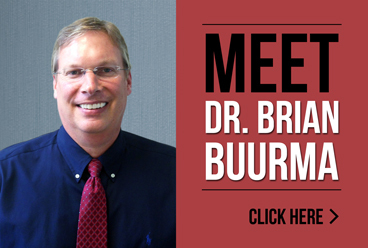 For more information about Brian Buurma DDS or root canal therapy, please contact our office or call us directly at 616.994.9722.